ANA (All Nippon Airways) launched its daily Seattle-Tokyo service on July 25 with an afternoon reception at Sea-Tac International Airport that included a welcoming speech by Governor Christine Gregoire. The hour-long event also featured a performance by Kaze Daiko, a traditional Japanese drum ensemble based in Seattle. Authentic sushi and sake were served to guests, who ranged from local politicians to media representatives to inaugural flight passengers. 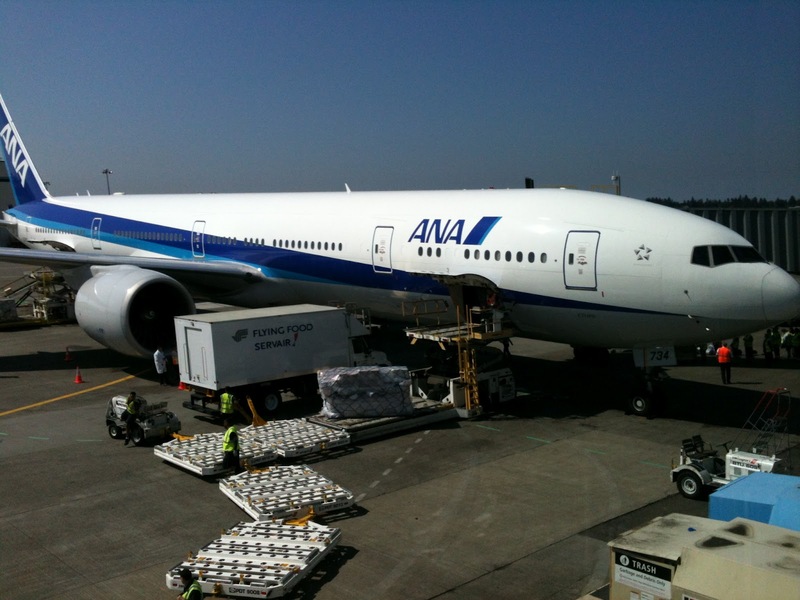 The new ANA service increases the number of non-stop flights to four from Sea-Tac to Japan. Delta flies to both Tokyo and Osaka, while United has one daily offering to the Japanese capital. Governor Gregoire called it a "vital link between Japan and Washington", acknowledging a strong trade/export relationship between the Asian country and our state, such as wine, apples and coffee (Tully's and Zoka coffee shops are now located within Japan). Seattle becomes the 7th US gateway city for ANA, which also flies out of Los Angeles, Washington DC, Honolulu, New York City, San Francisco and Chicago. In 2013, San Jose will be added. Company Senior Executive Vice President Keisuke Okada stated that the idea to make ANA an international airline competitor was initially planted here in Seattle when he attended a small conference hosted by Boeing many years ago. ANA will operate a two-cabin 777-300ER to Tokyo until October, when it then switches to the heavily buzzed (and delayed) 787 Dreamliner. Currently, the departure flight leaves Sea-Tac at 1:15pm with arrival time at Narita International Airport at 3:45pm the following day. The return flight departs Japan at 5:25pm and lands in Seattle at 10:55am the same day. Total flight time to/from each city is about 10.5 hours. Tokyo is an amazing destination with an up and coming gay scene that already thrives with dozens of bars in the Shinjuku Ni-chome and Shinbashi districts, and a few others scattered in nearby areas. Seattle Gay News' special Pride travel section, in the June 15 issue (online at http://www.sgn.org/), featured a cover piece on Tokyo. A separate travel feature on Osaka will print in September, followed by one on Kyoto soon thereafter. For those business and leisure travelers planning trips to Japan and/or Asia, know that ANA is a Star Alliance member and your earned miles can be credited to your United or US Airways accounts. For more information, go to www.ana.co.jp. You know him from Shortbus. He played the adorable Ceth. You might also recognize him from another indie film, the gay-themed Holding Trevor. Balancing an acting and music career, openly gay artist Jay Brannan is featured in an upcoming interview with Seattle Gay News. The Texas-born performer is currently touring the US in support of his newest album Rob Me Blind, which delivers him to Seattle next weekend. He's already played a series of dates this year in the UK, France, Spain, Italy, Germany, Israel and Australia. Brannan talks about his experience working on the cult movie Shortbus, his songwriting process, and tells us which song by a big female pop star he recently downloaded onto his MP3 player. If interested in seeing Brannan live in Seattle, scheduled at The Crocodile on August 2, go to http://thecrocodile.com/. For a complete list of remaining tour dates through the month of August and other news, visit http://jaybrannan.com/. Jay Brannan's interview with Seattle Gay News prints on Friday, July 27. Grab a copy at any number of businesses in the metro Seattle area this weekend, or view it online at http://www.sgn.org/ when the new edition is uploaded Saturday morning. Though it was an abbreviated performance of his completed Asian tour leg, Jason Mraz's show in Honolulu last weekend was undoubtedly wonderful. It was packed at the Waikiki Shell, an amphitheater located on one end of the city's busiest district and the Aloha State's largest tourist area. The weather that day was super hot, producing a beautiful warm night with the slightest of breezes. The Pacific Ocean is a five-minute walk from 'the Shell'. Mraz played a mellow, and sometimes jumpy, set that included "Bella Luna", "Lucky", "Only Human", "The Remedy (I Won't Worry)", "The Freedom Song", "Frank D. Fixer", and "You and I Both". The best song was probably "Living in the Moment", and if you haven't heard it live yet you need to. A vast portion of the show was taped for an E! series called "Opening Act", in which big name artists choose an unknown supporting act to open one of their concerts. Mraz chose a singer named Jono (if we're spelling that correctly), who hails from Colorado. Jono performed two songs twice before the headlining act went on stage, and then joined Mraz for two numbers during his set. With bushy hair, that he apologized for, and an untrimmed beard Mraz could've easily been mistaken for a beach bum. But he's still in great shape, and his voice has really matured - it's soulful with a wider range. Many fans in the audience excitedly shouted out "I love you" and other greetings throughout the concert, which actually clocked in at around two hours. At one point, Mraz told everyone to extend their enthusiasm to people they might come across in their daily lives, "like that barista who makes you a dynamite latte". The first half of Mraz's performance was a little on the tranquil side, yet the second half was livelier as he asked fans to sing along to "I'm Yours" and interacted a bit more with the audience. He had a full band with him, including a three-piece brass section and a side vocalist/violinist. There were times when the cameramen running around for E! created a distraction. From where I was seated, in the row directly behind Jono's family, it got annoying. Seattle Gay News didn't get a chance to meet up with Jason Mraz in Honolulu, as he was mostly occupied in his few days there recording snippets for the TV show. But we did connect with members of his management team, who assured us that he's looking forward to his upcoming North American tour that begins next month (contrary to what we said earlier that the Hawaii show was the kickoff date, our apologies). Mraz will play The Gorge Amphitheatre on September 22, and Seattle Gay News is hoping to cover the concert. We'll do our best to connect with Mraz before the show, if he's available. Read a full review of the Honolulu performance in Friday's issue (July 6) in the SGN. 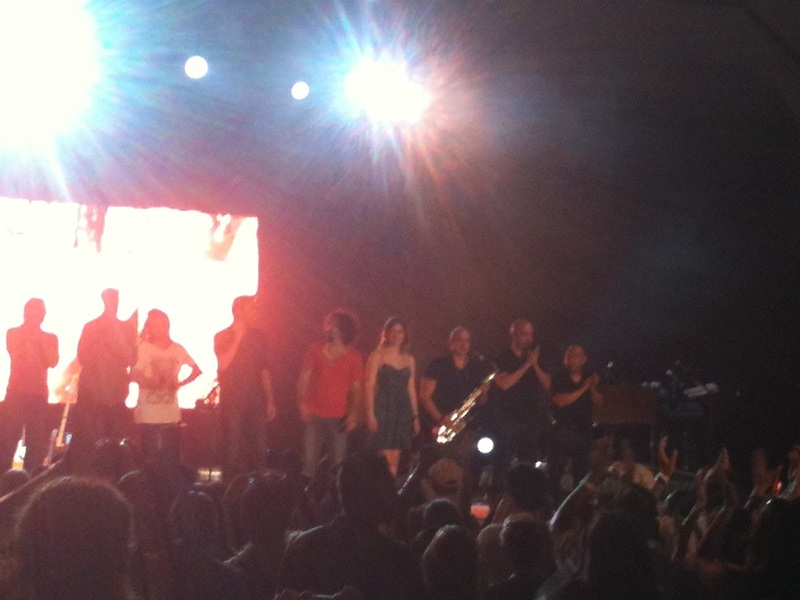 And to the Jason Mraz fans who strolled into Hula's gay bar after the show, it was great meeting you! * Our apologies for the bad photo, we're still getting used to our iPhone camera.